Lake Tahoe Paddling is proud to partner with Green Bucks to promote and contribute to the funding that is used to build, maintain and protect the hiking and biking trails, watershed restoration, wildlife protections, environmental stewardship programs and forest health of the Lake Tahoe basin. 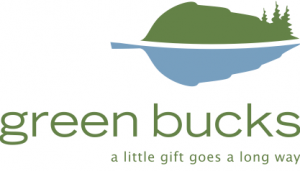 In partnership with Green Bucks, every race registration one dollar will be donated to support local projects to restore the watershed, build and maintain hiking and biking trails, protect wildlife, and fund environmental stewardship programs. Thank you. Lake Tahoe Paddling is proud to partner with The Tahoe LUNA Chix to bring together women interested in learning new sports, staying active and inspiring others to do the same. 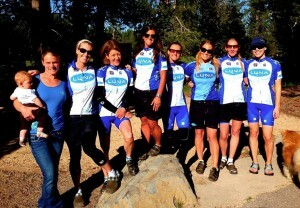 Their team is a small group of women passionate about cycling and the outdoors. They have a great summer schedule full of road and mountain bike rides, plus bike maintenance & skills clinics. Team LUNA Chix also participates in local races and volunteer opportunities such as trail building, mentoring and coaching. They encourage women of all ages and abilities to come out and join us this summer. Connect with the Tahoe LUNA Chix on Facebook to be updated on events! Lake Tahoe Paddling is proud to partner with The Tahoe Fund to promote the Lake Tahoe License Plate Program and the funding that is used to build, maintain and protect the trails, water quality, wildlife and forest health of the Lake Tahoe basin. Big Blue Adventure is proud to partner with Girls On The Run who believe that every girl can embrace who she is, can define who she wants to be, can rise to any challenge, can change the world. Can.